Community Voluntary Services (CVSs) develops, connects and supports local voluntary and community organisations, helping to improve the quality of people's lives in the areas they serve. Here is a summary of the CVSs within Nottinghamshire. Click the links below to find out more about the services they offer. They can help you set up your new group or charity and develop your aims, plan your activities, identify appropriate funding, advise you on governance for your group and put you in touch with like-minded organisations and groups in the local area. Their service is provided free of charge. Click here for more information about Bassetlaw CVS's services. Voluntary Action Broxtowe provides training and support for community organisations and volunteers. They recruit, train and support volunteers to deliver a range of services that tackle complex social problems in the Boxtowe community and enable people to make positive changes in their lives. Click here to find out more about Voluntary Action Broxtowe. Click here to find out more about Mansfield CVS. Newark & Sherwood CVS is a support and development organisation, promoting and encouraging local voluntary activity in the Newark & Sherwood area. Being at the heart of our communities, listening to their needs and speaking up for them is Newark & Sherwood CVS's driving force and they deliver a wide range of services in partnership with other voluntary and community sector organisations. They also work with local authorities, public service providers, business and community groups to deliver specific projects where their experience and connections are called upon. Click here for more information about Newark & Sherwood CVS. Voluntary Action Centre: Providing a space for organisations to meet and network, access training and promote their work. 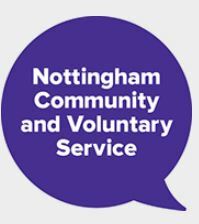 Click here for more information about Nottingham CVS. Rushcliffe Community and Voluntary Service (RCVS) provides a wide range of support and services to groups, helping those that are starting up, as well as organisations that are already established. They are committed to equal opportunities and to making their services relevant and accessible to all groups working to improve their communities. In addition to support for groups, they support individuals, particularly vulnerable people through the provision of dedicated services such as voluntary transport and befriending services. They endeavour to support joint working between voluntary and community groups and with statutory bodies; and helping to ensure that the interests and concerns of the Voluntary and Community Sector are properly represented. Rushcliffe Community and Voluntary Service is a member of the National Association for Voluntary and Community Action (NAVCA). Click here for more information about Rushcliffe CVS.